Anna Drake has lived in Columbia since the 1990s, long enough to consider herself an “honorary native.” She has always enjoyed creating art and took every class available to her throughout her school years. “Art has never not been a part of what I do,” she says. Growing up, Drake tended to complement her art hobby with a bent toward practicality, so it is no surprise that she earned two college degrees — one in communications, the other in art. She has continued to engage in both creativity and practicality as an adult; by day, she works at The Insurance Shop of Columbia, where she specializes in insuring art and other collections, and by night she splits her time between her family and her artwork. Over the years, Drake created art in several mediums, with one in particular garnering attention. 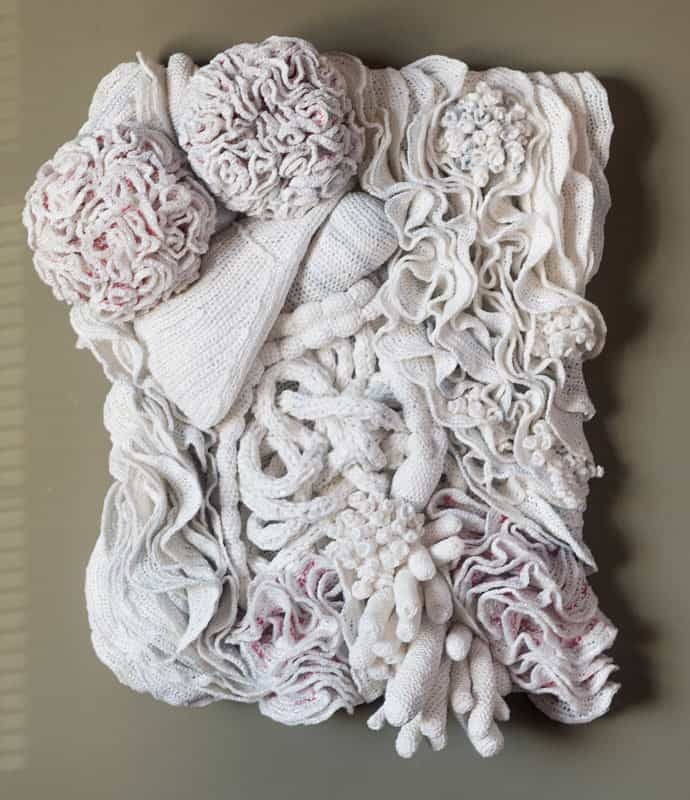 Always the practical artist, Drake pioneered a technique for reusing plastic grocery sacks to crochet one-of-a-kind, three-dimensional pieces that resemble the ocean floor and coral reefs. Two of these pieces recently received first-place ribbons in the fiber category at the Columbia Art League’s Boone County Art Show. That the finished pieces are evocative of ocean landscapes is no accident. Drake’s technique allows her to indulge her artistic side as well as the part of her that is practical, environmentally conscious and passionate about recycling. Drake and her husband, Greg, have been active in the “Reduce, Reuse, Recycle” movement for many years. Together, they seek ways to “upcycle” discarded or seemingly useless materials, transforming them into something beautiful and/or useful. Knowing how ubiquitous plastic pollution — and grocery sacks in particular — is in the world’s oceans and other aquatic ecosystems, Drake’s work has multifaceted benefits. One event alone — the 2012 International Coastal Cleanup — collected more than 1,000,000 plastic bags! So by transforming plastic bags into art, Drake is helping reduce oceanic pollution, doing what she loves and, most importantly, moving the conversations about pollution and recycling forward. “The most inspiring pieces combine art with both crochet and knitting, and all of them feature a piece of coral reef,” Drake says. Drake was inspired to create these pieces while going through a tough period in her personal life some years back. There were days she felt as if she were “down in a valley” and just getting by. Like her mother and grandmother before her, she practiced crochet as a sort of therapeutic, meditative practice. 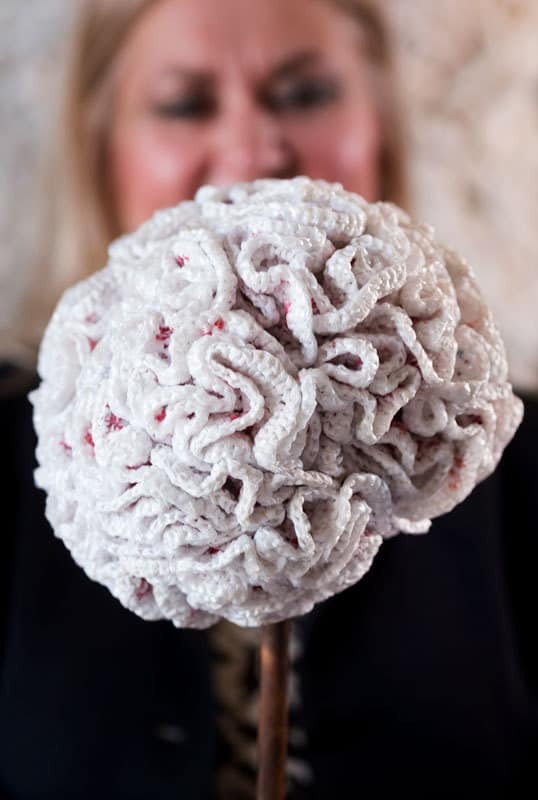 It was during this difficult period that she evolved her practice and devised an innovative method of slicing plastic bags into strips, stringing them into a type of yarn and crocheting (and sometimes knitting) something both beautiful and inspiring. While creating those first pieces and transforming trash into treasure, she reached the other side of the valley and eventually climbed out, finding both herself and her artwork transformed and renewed. Drake has worked with plastic yarn (or “plarn,” as she calls it) for five years now. She hopes her art will inspire others to consider different ways in which trash can be transformed into something useful. Drake also hopes that others will be reminded while journeying through life’s peaks and valleys that just as one man’s trash is another man’s treasure, people, too, are much more beautiful, useful and important than they may believe.